Palmistry, also known as chiromancy, is the practice of telling fortunes from the lines, marks, and patterns on the hands, particularly the palms. According to those who tell our fortunes, each line on the hands represents a different aspect of one's personality and future (predictions). Palm reading is an ancient mystic art, with its roots deep in India's past. 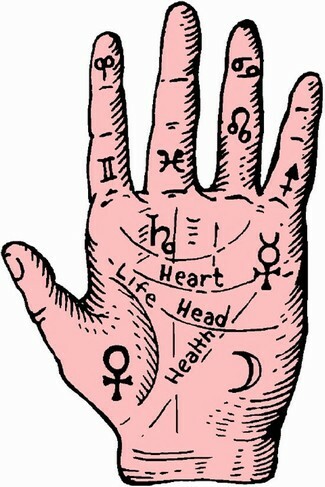 Today, palm reading is one of the most common methods of divining, along with astrology. The earliest known text on palm reading was written by a Hindi sage in the third millennium BC entitled "The Teachings of Valmiki Maharshi on Male Palmistry," and set out many techniques which are used into the modern day (wise). Since then, Palmistry has been used in Egypt, China, India, and even during the Middle Ages to detect witches since it was believed that certain spots on the hand made a pact with the Devil. Many people clam that palmistry works because your hand changes as you do and no two hands are alike because you, and your cells are unique. Although this is true, there has been no scientific evidence to ever prove that the "predictions" fortune tellers make by simply viewing some one's hand have come true (palm).